After the poor pizza show from Vapiano, I was keen to quickly erase the memory with something rather better. With new delivery services to explore in my new (temporary) Bruntsfield residence, I hit upon NKD Pizza and thought they might be up to the task. NKD has been trading for a wee while from a base in Mornngside with plans afoot for other branches across the city, including in Corstorphine. 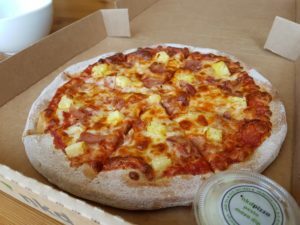 My requirements were simple, so I opted for their take on the Hawaiian, called the Aloha (£11.50). The inevitable discount voucher made the service and delivery charges only 20p more. The pizza was with me in double-quick time, a good fifteen minutes ahead of schedule. It looked pretty smart. It was accompanied by decent pesto mayo for crust dipping. The topping proved of pleasing quality, but the floury, 10-grain base was a little strange. I paused for a moment to think what it reminded me of, eventually settling on it bearing a close resemblance to a kebab pitta. It was an oddly leathery texture for a pizza base. Still, the topping was good enough to carry the day and make for fairly satisfying eating. So overall, NKD Pizza served me a decent eat but there’s work to do to improve their pizza bases. If this can be achieved I can see them building an appreciative audience, particularly if they keep up the speedy pace of delivery. I’m unhealthy and enjoy unhealthy options. I always think that if you’re going to ending run a pizza as a treat then you should enjoy it. To me, pizza isn’t especially healthy and any attempt to make it healthier risks ruining it. If the end result was 10% less enjoyable but 80% healthier then this would be a decent trade-off. When my wife and some friends/family ordered from here after being enticed by a 60% discount I decided I wasn’t going to risk it – especially as I’m a very fussy eater and know what I like. I did taste it and, like everyone else, thought the base was very unusual and not quite what something being sold as ‘pizza’ should be. I think that if people are trying to be healthy they won’t order pizza and if they order pizza then they won’t want this. Of course, I may be wrong but I wouldn’t advise a rapid roll-out or further branches. If this one survives two years then they’ll be doing well.